The RB-AEC 1U rack-mount is an acoustic echo canceller primarily designed for the benefit of studio personnel for television and radio. When a studio presenter’s microphone signal is played out through a monitor speaker in the control room, it can be picked up by the control room microphone(s) and returned to the presenter’s earpiece as an undesirable echo. In circumstances where green screen video processing is taking place, the delay can be greater than 200ms. Additionally, the dimensions, occupancy and distance between mouth and microphone can further influence the echo. The RB-AEC is used to remove the entire control room monitor speaker output from the presenter’s feed by adapting to the environment in which the control room microphones are placed. Although acoustic echo cancellation is more commonly implemented in telephony systems, the Sonifex RB-AEC is designed to produce broadcast quality cancellation. Much like during a conference call configuration between two rooms, each room has a microphone and speaker to conduct a conversation. When an occupant of one room speaks, it takes a certain length of time before it is received in the second room. Without a suitable solution this ‘delayed’ signal can then be captured by the microphone in the second room and returned back to the first room as an echo. In the particular example of TV production, as well as the processing/transmission delay, sound reflections from the control room monitor speaker into the control room microphone(s) cause the studio earpiece to suffer further delay. The sound reflections in the control room vary with the contents of the room including any personnel present. Also, different frequencies produce varying reflections across various types of surfaces and magnitudes within the room. For a 15m distance between speaker and microphone the delay is as much as 40ms.The DSP solution offered by the RB-AEC can dynamically compensate for varying configurations. The post-processed transmission output program from the studio (A) is sent to the RB-AEC as an analogue or digital audio signal (the stereo input is auto-sensing) which acts as a mix-minus to the input signal (B) from the Control Room. 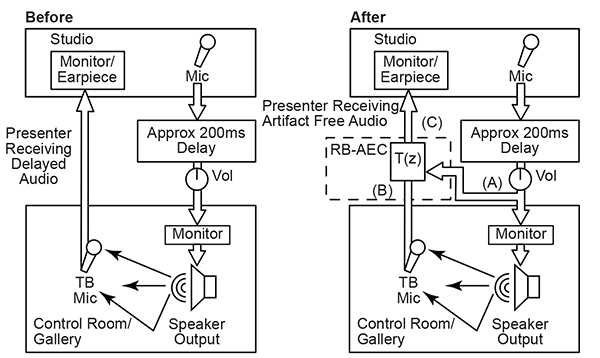 The RB-AEC removes the unwanted acoustic echoes so that the audio sent to the presenter’s earpiece (C) is free of echoes and reflection artifacts.